We are proud of our mini girls and the beautiful structure, awesome personalities and great health. We truly are blessed with some of the best. 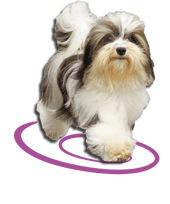 Our pedigrees are full of champions with tons health testing done. 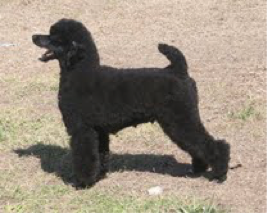 This can be verified on OFA and pedigrees can be seen on poodlepedigree. Violet is an amazing rare silver beige color. She is super pretty, great movement and just a mommas girl. She came from a silver to silver breeding and I was wowed and had to have her! 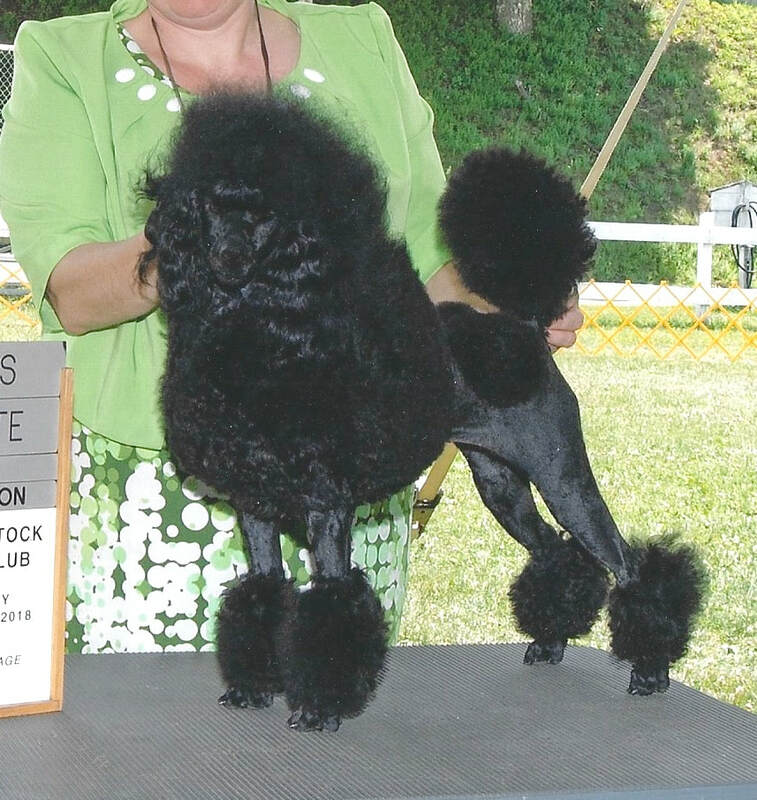 She has great coat and once the judges could figure out her color she started winning all the time. We look forward to having puppies by her in 2018. Future is what we look forward to. Future went in the ring and championed very fast from BBE class. Winning majors and breed over specials. She will be health tested at two(New Years Day(born first day of year). And then we shall see what she can bring our next generation. Leap is STUNNING!!! She is blue, sired by silver, so will be my foundation for silver. She has superier movement. Pretty face, and just fantastic all the way around. She finished fast from Bred By and is now a Grand champion. She has already gained a group placement this year too! Mirage is a jet black little girl out of our Layla and jitterbug. 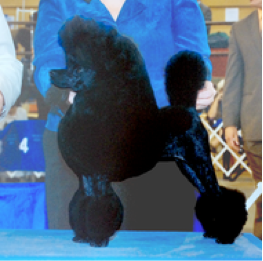 She loved the show ring and would just stand and pose for the judges. Super showy topped off with great movement and strucutre made her champion quickly with some nice wins. Shes a great mommy with the best pups. 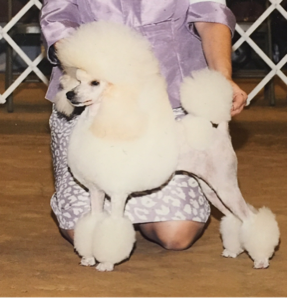 Pippy was an amazing show dog. Loved the ring and finished very quickly. She is daughter of Layla and Jitterbug. She is jet black and beautiful movement. She is smaller girl at only 11 pounds and 14" tall. She will be health tested when she turns two. Then we can look forward to her babies. Melodee is a super jet black sweet little girl.She is under 14 inches tall, but has big body and big coat. 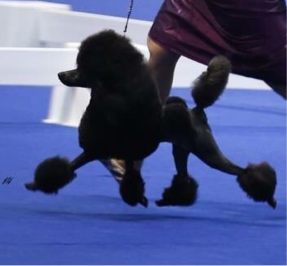 She has outstanding movement. She got her championship owner handled from Bred By class. Her mother is Myra, sire is DJ. She is a couple generations my line now. Layla is a high spirited, fun, and outgoing girl. She is a take charge, nothing scares her girl. She is jet black daughter of Faith and David. Long line of all champions and health testing done. She is 14" tall and very compact and showy. Beautiful thick coat. She is fully health tested and produces awesome puppies, some in the ring now. Photo taken day after whelping her first litter. Elizabeth or Lizzy as we call her finished her championship easy. She is a very sound and correct girl. She has the sweetest and most loving personality. Her daughter is on the purple back ground photo on homepage. She makes the smartest and most amazing babies.